This is a picture taken in front of 1055 Grand Concourse, looking north. To the far left you can see the walls of the Andrew Freedman Home at 1125 Grand Concourse. This is a picture taken in front of 1055 Grand Concourse, looking south towards 165th Street. 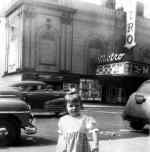 This photo was taken in 1950 or 1951 of me (I was around 2 or 3) across the street from the Metro Theater. The Metro was located on Webster Avenue between Ford and 183rd Streets. The marquee reads Richard Widmark in "Night and the City" and "Love That Brute". It also shows a linoleum/bedding store that was located on the corner of Ford Street and Webster Avenue. Editor's Note: "Night and the City," a film-noir classic, and "Love That Brute," a Grade-B comedy, were both released in the spring of 1950, so it's most likely that this picture was taken in that year. This Model-T Fire Truck was purchased from the Rockefeller Estate for the Edgewater Park (Throgs Neck) Volunteer Fire Department. The man is my father, W. J. Taylor, Sr., fire chief for over 20 years. This picture was taken in the late thirties. This picture was taken in the late 1960s from my porch at 1357 Purdy Street when I was a kid. The scene is looking northeast toward the intersection with Starling Avenue. I vivdly remember enjoying those mountains of snow left over from the plows and other shovellers. Stores along Morris Park Avenue, taken in 1971. Rosario's Bakery (formerly Pat's Bakery) on Morris Park Avenue in 1972. This picture of my mom, my older brother and sister and myself (the cute guy in mom's arms) was taken in July of 1947 in front of 115 East 168th Street. In the background you can see the Jerome Avenue El. The picture is looking west toward Walton Avenue. This photo of the "old" Yankee Stadium was taken from the track of McCombs Dam Park in July of 1959. Joyce Kilmer Park at the corner of 161st Street and Walton Avenue, around 1957. In the distance one can see the structure of the Woodlawn-Jerome IRT Elevated Line. Closer up is the entrance to the "D" line Subway. The La Primadora sign marked a well-trafficked newsstand-cigar store. The liquor store next to it belonged to a man called Maurice. In later years I made deliveries for him. Across the street was the Bronx County Court House. In the photograph, my brother, Joe, and my father, Patrick Kennedy, are facing Yankee Stadium.